If you run a network, you’ve discovered that Internet traffic places high demands on available bandwidth. For example, music file download programs can significantly tie up resources. Conversely, incoming Web traffic might overwhelm your organization’s ability to send out email by not letting SMTP packets through. Though many packages exist to manage network and Internet bandwidth—firewalls, proxy servers, and load-balancing software, to name a few—it’s hard to find a single package that can handle the largest organization’s needs. Lightspeed Systems’ Total Control, however, provides one such complete package with its impressive capabilities. In its basic configuration, Total Control uses Lightspeed’s IP Magic technology on a server between your router and the Internet. This server functions to inspect, prioritize, filter, dispatch, and potentially modify all IP packets going in both directions between internal and external network cards. 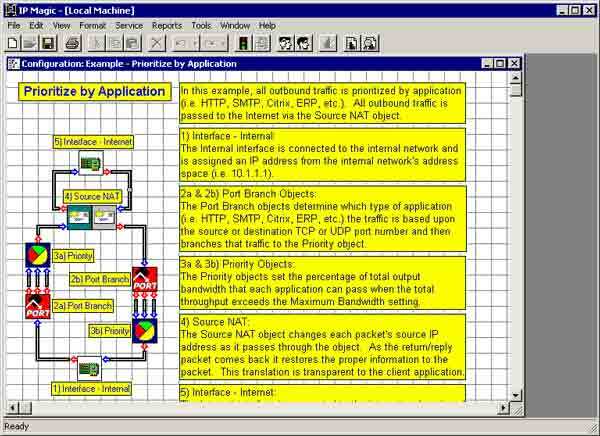 The IP Magic Manager lets you determine, among other things, if this server will monitor traffic, perform Network Address Translation (NAT), boost packet priority based on source or destination ports, or block traffic to specific IP addresses. 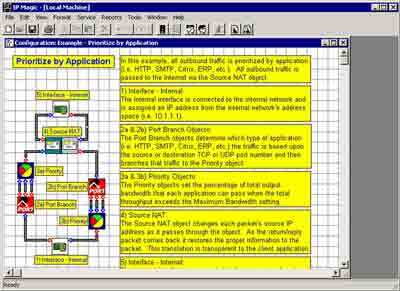 To use IP Magic effectively, you need a system with at least two network cards. I experimented on a system parked outside of my network’s firewall. I found that setting up basic rules, such as prioritizing traffic by destination port, is a simple process. Just drag and drop the right objects (in an interface reminiscent of Visio), double-click to set properties, and start the IP Magic service. Starting from such a basic configuration, you can advance to more complex uses, such as load balancing and traffic monitoring, by incrementally adding more objects. A well-written manual does an excellent job of explaining the powerful options in each dialog box. This power does, however, come at the price of a steep learning curve—and it isn’t inexpensive (contact Lightspeed for pricing). But if you add up what you’re spending on network interface tools now, you might find this all-in-one package attractive. You should also expect to spend substantial time setting up and polishing your configuration; but, ultimately, this benefits you, because your network interface will be less of a “black box.” Overall, I was impressed with Total Control and its balance between ease of use and power.